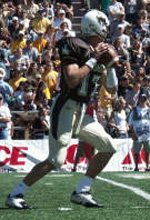 Corey Bramlet was signed as a free agent after the draft by the New England Patriots and he was the only QB to attend the Pats rookie camp. "As the only quarterback at the New England Patriots' rookie minicamp, Corey Bramlet is relishing the spotlight. 'It's kind of nice to be able to take all the (repetitions) and get into the offense,' said Bramlet, an undrafted free agent from Wyoming. 'It's a good way to start learning. I just have to take advantage of it.'" If Doug Flutie retires Bramlet may be able to stick with New England, but right now it seems like a long shot.